The summer of 1947, a ranch foreman in New Mexico discovered some peculiar wreckage in a field. The Airforce initially reported the existence of a “flying disk”. Extraterrestrial "experts" claim that aliens and UFOs from this crash and others have been housed in Area 51, a military base in Nevada. The military quickly changed its story and said the wreckage was a weather balloon. It also denied the existence of Area 51, but just this year the CIA admitted that Area 51 really exists. If you’re not a believer, all the more reason to visit the many extraterrestrial sites in the regions to see if you can be convinced – or, at least, take some campy pictures with aliens to show your friends. Read on for some great (and cheap) roadside attractions for your next long drive through the desert. unlimited access to various sets and dioramas featuring life-sized alien figures and props for you to take pictures. 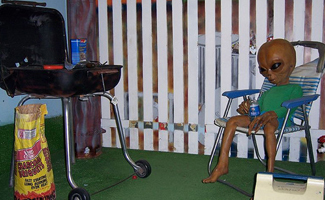 Snap your next Facebook profile picture next to some very convincing aliens in a spaceship, watching television, riding on a motorcycle, or having a casual backyard barbecue. If you're day-tripping from Las Vegas, you may want to check out Area 51, which is closer, instead of to Roswell. The C.I.A. has admitted that the military performed top-secret testing on spy planes inside the compound. The accessible area outside the fence is fairly desolate and exciting only for its proximity to extraterrestrial history. A more mandatory stop is The Little A'Le'Inn (say it aloud), an hour and 45 minutes away in the middle of the “extraterrestrial highway”, Route 375, where many UFO’s have been sighted. The inn has mobile homes available for $35-$45 per night. If mobile homes aren’t your thing, you should still stop for a bite to eat. Your fellow diners at the greasy spoon restaurant will keep things interesting. Conspiracy theorists flock here, the only business in a 45 mile radius of Area 51, to discuss the latest in government coverups. Grab a burger, join the discussion, and maybe you’ll finally conclude that the truth is... out there.